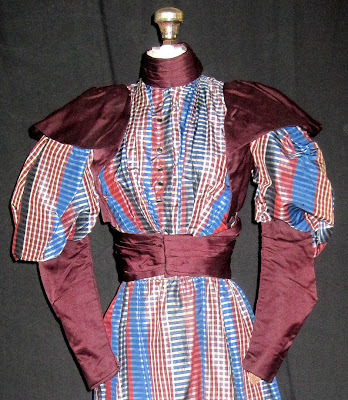 All The Pretty Dresses: 1890's Young Miss Dress? Would you be so kind as to comment below how you found this blog? I do not have facebook (for a VERY good reason) so I know it's not through me. Most people come here through tumblr or twitter. Please, check out some of the other items I have up as well if you are looking for colorful outfits to base steampunk outfits off of. 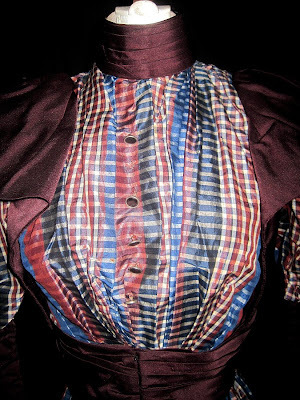 This "Gay Ninties" Victorian plaid 2-piece day dress is colorful and in great condition. I believe it was a girl's dress due to the measurements. 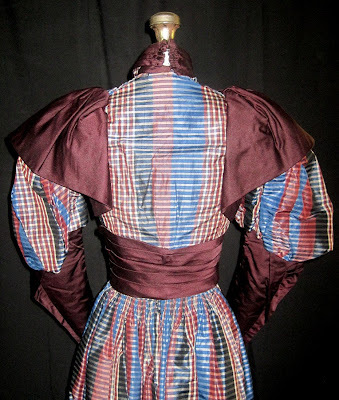 The gown is a plaid taffeta with burlap-like lining and a velvet hem protector. The gown is a colorful array of blues, bronze, rose and cream. The bodice if very fitted and has a center front hook/eye closure. Decorative buttons also accent the front closure. 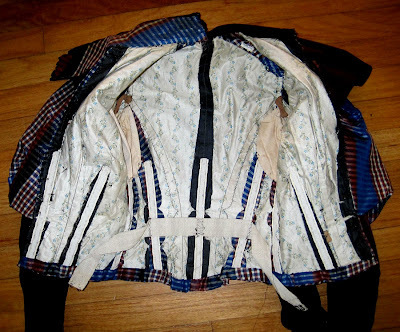 The bodice is boned and is lined with a floral patterned lining. The leg-of-mutton sleeves have a bronze colored accent which begins at the waistlined and goes over the shoulder. The fitted lower portion of the sleeve is also done in this bronze colored material, as well as the stand-up collar and waist belt. The skirt is full and is tightly gathered in the back. It has a center back hook/eye closure. The gown is in very good vintage condition. There are a few small areas that have torn a bit, but nothing of concern. The gown is wearable, but as with any item of this age, it should be worn with extreme care. The gown measures as follows: bodice chest=26"; shoulder to shoulder=11"; bodice length (neckline to waistline)=16 1/2". The skirt measures: waistline=20" and skirt length (waistline to hemline)=41". My guess is this is a teenager's Sunday best. This is gaudy even for the Victorians! The insides are interesting given the rather pretty print used for lining. Do they have this in black? Knitted American Civil War Bonnet!